Exit Seats – What did I agree to? So what did I just agree to do? Well for those of you that have agreed to this position of power, note that there are certain written responsibilities that come with the extra leg room. And if you do have any relatives flying on the plane with you then you should not be sitting in the exit row. These are serious federal laws. crew member is not available to assist. – Locate The emergency exit. – Recognize the emergency exit opening mechanism. – Comprehend the instructions for operating the emergency exit. increase the hazards to which passengers may be exposed. – Follow oral directions and hand signals given by a Crew Member. 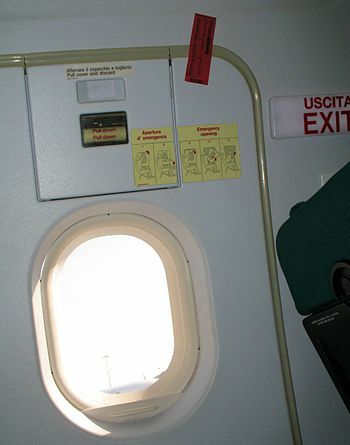 – Stow or secure the emergency exit window so that it will not impede use of exit. – Asses, select, and follow a safe path away from the emergency exit. – Reach upward, sideways, and downward to the location of the emergency exit. – Grasp and push, pull, turn, or otherwise manipulate mechanisms. – Push, Shove, Pull, or otherwise open the exit. weight of overwing window exits. – Reach the emergency exit and exit the aircraft expeditiously. – Have the ability to understand oral Crew commands. shouted by Crew Members without assistance beyond a hearing aid. or pets, that might prevent him from performing the applicable functions. or more of applicable functions. Exit row seat 14F on a Boeing 737-800?